One way or another, Bahrain was a pretty good race, as once again it showed how closely matched Ferrari and McLaren are right now. Felipe Massa became the third winner in as many races, Lewis Hamilton vanquished his teammate, and the day ended with the top three drivers equal on 22 points. However, the single most entertaining moment involved a third party interloper. When Nick Heidfeld swooped around the outside of Fernando Alonso, a spontaneous ripple of applause swept through the Sakhir media centre. The double world champion had been cleanly overtaken by the season's hottest underdog. "The problem was his top speed was better than mine," Heidfeld said afterwards. "He had a small mistake in Turn 13, and then it kept on for like three corners, and finally I managed to go around the outside. "It was quite difficult. I thought I was quite a bit quicker in the second stint, because I had new tyres left and he didn't, but he had a bit better top speed, so it wasn't so easy. He made a mistake, and then it took about three or four corners, and finally I got by. "It was very tight at the end. I had to try and stay focused after that, because it was such a fantastic moment, because I didn't expect to overtake him on the circuit..."
It was indeed quite a moment, and it underlined once again that BMW Sauber are clearly established as the third force in this year's world championship - something that nobody could have anticipated at the end of last season, when it seemed highly unlikely that the Swiss-German alliance would so comprehensively leapfrog both Renault and Honda. Heidfeld has now finished fourth in all three races, and with no retirements yet among the top two teams that means he has beaten one Ferrari or McLaren driver in every race. In Australia it was hardly surprising that he out-ran Massa, considering the Brazilian started at the back of the grid. He again beat Felipe in Malaysia, albeit after the Ferrari man had run wide - but he had to be close enough to take advantage and stay in front for the rest of the race. Being close enough was the key too in Bahrain where, unhappy with his set-up and lacking confidence in his brakes, Alonso struggled for pace. Heidfeld was able to keep in touch, and when the opportunity arose, he was able to take it. "I think it was a very nice race," he said. "I also said that after the last race, but I think at the moment I'm also getting the chance to show good races. It was great fun, overtaking on the circuit. It's what everybody wants, it's what everybody enjoys, it's just a bit too difficult at the moment." Heidfeld is clearly loving every minute of this season, and he probably enjoyed the fact that in Malaysia there was a mini-controversy about his future after he was linked to Toyota. He's had a lot of misfortune at the hands of team bosses over the years, and BMW motorsport director Mario Theissen's near obsessive championing of Sebastian Vettel has suggested to the outside world that Heidfeld is only keeping the seat warm for the youngster. Being linked with overtures from another team, whatever the real story, probably did him no harm. When in February I asked him about Vettel, Heidfeld replied that he didn't think a team would replace a driver with someone slower, and to his credit he has ignored the politics and just got on with the job. Of course, having to sit out the first Friday session in Australia while Vettel did his thing did not go down well with Heidfeld - nor with teammate Robert Kubica in Malaysia. From the outside, it has always seemed crazy that Theissen is willing to make even the tiniest compromise as far as his two main drivers are concerned, especially now that the team is so close to the front. The fact that a clashing World Series by Renault commitment sent Vettel to Monza rather than Bahrain allowed everyone to see how a weekend would unfold when run to a more normal schedule. Despite his run of results, Heidfeld still has his feet on the ground: "There's still some way to go. It's three times fourth position, but we have to see there are still two teams quicker than us, and just sometimes we can probably go in there. "The target, before the season, was to improve and finish in fourth position in the constructors' championship. I've already changed that, I want to finish third in the constructors, but I still think that is a very high goal. "If you look where we were one and a half years ago, I can only highlight it again and again, we were P8, and at the moment we are P3, maybe even a little stronger if the guys in front have some problems." To the surprise of many, Heidfeld has comfortably outperformed Kubica so far this year. The Polish rookie can't use the fact that he doesn't know the circuits as an excuse - he ran on all the Fridays last year and had of course tested at both Sepang and Sakhir - so it just goes to show how good a job Heidfeld is doing, and how difficult it is to get everything just right. 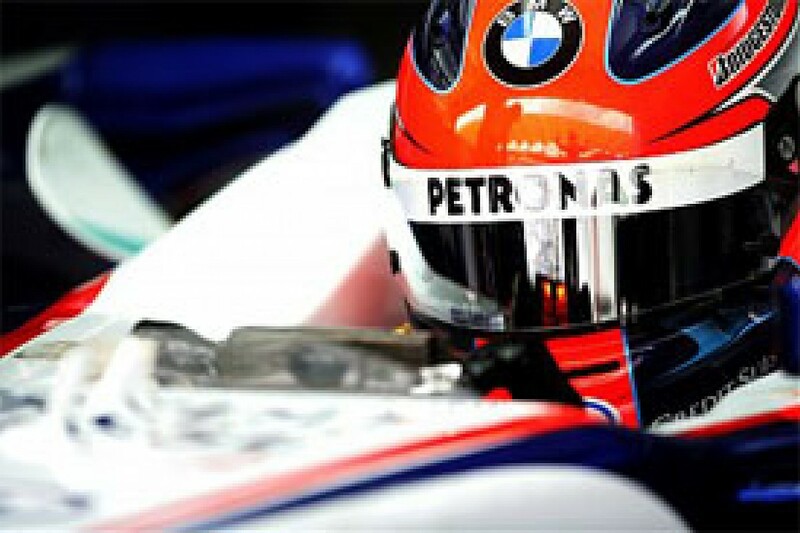 Kubica has of course endured all the BMW bad luck going, experiencing a gearbox failure in Australia and being delayed by wing damage, a radio failure and other problems in Malaysia. In Bahrain he suffered the indignity of an open fuel flap, which inevitably compromised his aero performance for a whole stint. He did at least bring the car safely home sixth, logging his first points of the year, albeit some way behind his teammate. "It's a very positive weekend for us, Nick fourth and me sixth," he said. "It's the first time in the points for me this season. We had a small problem when we couldn't close the refuelling cover, so it was costing us a lot of downforce, but unfortunately we couldn't fix this problem during the race. "I was losing out, especially in high-speed corners and under braking. I did what I could do with the balance of the car and the small problem that we faced. But anyway, it was a good weekend for me and BMW, so everything was positive." Despite his bumpy start to the year, he is fully confident. "For sure, before the season started we would have taken this result, but in my case there is still some work to do, and finally we can get there," he added. "The balance was still not perfect, but we just have to run a bit more to get a bit more knowledge about tyres and everything, and get reliability. "We hope to improve. Already I think the pace is there, and reliability seems to getting there, at least with my car. Let's wait a bit, and I think we will be there also in Barcelona." In Bahrain his best race lap was some 0.349 seconds off Heidfeld's, but it says a lot about the huge gulf between BMW and their pursuers that, despite struggling to match his teammate's pace, Kubica was under no threat from behind. Of course it's way too early to assume that the Pole will always be second best. He didn't have a chance to get a good Q3 lap at either of the first two races, and there are also suggestions that his unusual driving style is currently less suited to the car and tyres than Heidfeld's. But that pattern can change as the season goes on. Once he enjoys a trouble-free weekend he should also be right up there, and if anything, he is potentially more aggressive than Heidfeld on the first lap, as he showed in Monza last year. When he does start fifth, it could be an interesting first couple of corners. "Everybody in our team was frustrated after seeing me retire in Melbourne and seeing me drive a really slow pace in Malaysia," said Kubica. "Of course we have to take profit now that we are strong in the beginning of the season, and make sure we finish the next few races. "In Australia I was running cleanly in fourth place, and it was easy for me to find the pace, and I didn't finish. I get the feeling that in Malaysia I was really strong until a certain point of the weekend. In Malaysia in the testing and also up to Q3 I was the only one who could stay close to Ferrari and McLaren. "I think it depends on the car balance and the configuration of the track. I think we are quite strong on long corners, and the car is performing well. Of course all the guys in Hinwil and Munich will try to push to develop the car as quick as possible, and maybe close the gap in a few Grands Prix." The biggest smile in Bahrain was that planted on the face of Mario Theissen after the Heidfeld overtaking move. And who can blame him for looking a little pleased with himself these days? It's still less than two years since he pushed the BMW board to take over Sauber and go racing under the company's own name, a decision that a lot of paddock critics scoffed at. And yet against the odds, it has paid off. He has overseen a steady expansion of the existing Hinwil resources. New personnel have come in and the transmission department has been switched to Munich in an attempt to make full use of factory R&D, but in essence it is still the same Sauber team, with steady hand Willy Rampf guiding technical matters. So far, everything seems to be gelling, in stark contrast to teams such as Toyota and Honda, where there's a desperate search for the right recipe. For Theissen, the Bahrain performance was the highlight so far. "It was a fourth place like the two races before, but a very special one," he smiled. "For the first time we could go the pace of the top teams and Nick was the only one out of the top six to overtake a car on the track - and that was a very special moment for everybody in the team. I had hoped that he could catch him, but I was really surprised that he was able to overtake Fernando. "Nick was excellent. He is fully exploiting the potential of the car, and apparently doesn't make any mistakes. So it's a very strong performance. I know that he's very strong, especially under pressure, especially when he sees the potential to catch the guys ahead of him. I expected him to be that strong." And he has every sympathy for Kubica's ongoing bad luck, adding: "That will go away, he will be there as well in the coming races." The big question, of course, is can BMW Sauber maintain their form? The sheer size of the gap to their pursuers and the fact that the advantage was evident at three different venues suggests that the situation won't change dramatically in the short term. But obviously everyone else is hard at work over the break before Spain, fast tracking new parts into the system, some of which were deemed necessary a while ago but simply couldn't be introduced in time for the opening flyaways. BMW's challenge is to maintain their own development momentum. The car was clearly good from the first time it took to the track in Valencia, but improving it on a consistent basis is always another matter. On the plus side, it seems pretty clear that the team have a good handle on aero and, helped by their wind tunnel and substantial investment in CFD and their new supercomputer, their should be able to maintain that form. Others have to properly identify their weaknesses before they can address them. 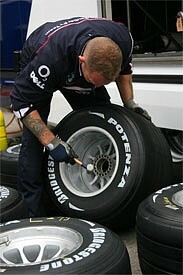 It may also help that the tyre situation is a constant this year. In common with McLaren, BMW appeared to make a much easier transition from Michelin to Bridgestone than the likes of Renault and Honda. While the others can obviously catch up, the fact that the goalposts are no longer moving means that BMW could retain their advantage. "We brought both cars home P4 and P6, and now we have a reasonable gap between us and number four, so we have really established now as number three," said Theissen. "Obviously four weeks is a lot of time. Factories are running in Hinwil and Munich, and we will have new things for Barcelona. "Usually you would say if you're quick in Barcelona you can be quick everywhere, so for me it'll be really interesting to see what we can do. We will have a test a week before the race, and that should give us a hint about where we are." The fascinating thing is that BMW appear to be in a no-lose situation as far as strategy is concerned. The gap to those behind is large enough that the team can pretty much guarantee earning fifth and sixth on the grid, and still keep their options open for the race. In Australia the team went to one extreme with Heidfeld, running him light (and earning third) because there was a strong suspicion that a safety car period would intervene. However, in the last two races he has been at least as heavy as any of the top four guys. If Heidfeld - or Kubica - can get a place or two at the start, then great; if not, they can still try and keep in touch and maybe make a pass on the first stops. It's a great position to be in, and it forces the front runners to keep on their toes. "I think the window of strategy in our case is quite large," Kubica agrees. "We would have to go really light to compete with McLaren and Ferrari, and there is not really anybody behind who can disturb us. We are quite easy in this position at this time. "And if we can jump in front of someone, like what happened with Nick after Massa had that mistake, maybe we can even go forward."